Finally we had a weekend where we didn't have to go anywhere or do anything! The first one in ages! And what makes it even better is for me, it's a loong weekend! We did nothing but eat good food (which is actually probably bad!) and watch movies. We went to the cinemas (Terminator 4...all I can say is I am in LOVE with Sam Worthington!) and we hired (and bought!) dvd's. 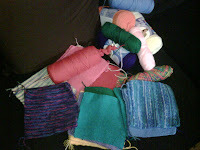 I also decided on Thursday that I was going to get back in to my knitting and finish the blanket I started last year! In all fairness, I got married in August last year, so from mid-July onwards it was nothing but wedding in my brain! I'm not a good knitter and I can really only do basic knit stitch, but I'm knitting squares, and once I've knitted them all I'm gonna get the MIL to show me the best way to put them all together. Then I wanna get some quilting wadding and backing and kinda turn it into a knitted patchwork quilt! I can't sew at all so I am looking forward to learning as it's been something I've wanted to do for a long time. Been dropping hints to the hubby about getting me a sewing machine for my very soon birthday so I can try out some of the stuff in the books we sell at work, clothes and things. 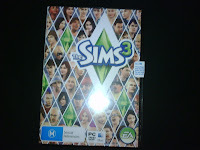 The other thing I spent time doing on the weekend (while the footy was on) was playing The Sims 3. I love The Sims, I got the first one when it came out and my brother-in-law got the second one which he used to let me play, but I haven't played in ages so I was really looking froward to the new one coming out. It's very addictive though so I have to limit my time on it, otherwise I'd be on it forever! So anyway, that was my weekend. I hope everyone else had a great weekend too. How was yours? Did you get up to much, was it relaxing? good to see yours was blissful! That sux! There's nothing worse than getting stuck in the end-of-long-weekend traffic, takes away all the relaxation of the weekend! I hope you had fun in Forster!